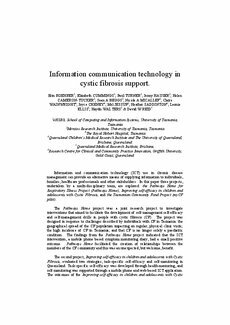 Information and communication technology (ICT) use in chronic disease management can provide an alternative means of supplying information to individuals, families, healthcare professionals and other stakeholders. In this paper three projects, undertaken by a multi-disciplinary team, are explored: the Pathways Home for Respiratory Illness Project (Pathways Home), Improving self-efficacy in children and adolescents with Cystic Fibrosis, and the Tasmanian Community Fund Project (myCF pilot). The Pathways Home project was a joint research project to investigate interventions that aimed to facilitate the development of self-management self-efficacy and self-management skills in people with cystic fibrosis (CF). The project was designed in response to challenges described by individuals with CF in Tasmania: the geographical spread of the CF population impacting on regular, physical clinic visits; the high incidence of CF in Tasmania; and that CF is no longer solely a paediatric condition. The findings from the Pathways Home project indicated that the ICT intervention, a mobile phone based symptom monitoring diary, had a small positive outcome. Pathways Home facilitated the creation of relationships between the members of the CF community and this was an unexpected, but welcome, benefit. The second project, Improving self-efficacy in children and adolescents with Cystic Fibrosis, evaluated two strategies, task-specific self-efficacy and self-monitoring in Queensland. Task-specific self-efficacy was developed through health-mentoring, and self-monitoring was supported through a mobile phone and web-based ICT application. The outcomes of the Improving self-efficacy in children and adolescents with Cystic Fibrosis project suggested there was sufficient positive response to warrant further investigation and a widening of the scope of the projects to encompass a suite of products to support the CF community. The third project MyCF has three main aims of improving access to educational material on CF, increasing Community Support and developing a Health -Mentor System. The findings from the myCF project pilot appear to reflect those of the previous projects. The participants perceived the inclusion of educational, mentoring and symptom-monitoring elements onto the one platform to be of benefit to them when interacting with the ICT. myCF is an extension of the previous two projects as it incorporates the daily symptom diary into the web portal, allowing integrated services to exist in one ‘virtual’ place. The myCF website design has evolved from the Pathways Home project, with the diary and support mechanisms undergoing several reviews and further development to achieve a clean, accessible site platform. The combined platform of a web-based delivery with a mobile phone acting as an additional input tool integrates ICT. Individuals can access the portal daily, even when computer based Internet access is not available. This functionality was the result of insights gained from the previous two projects. The myCF project pilot has highlighted the need for further research into how patients interact with ICTs designed for chronic disease support and how patient’s needs are represented when developing such a system. The analysis of the myCF project pilot experience is focussed upon how it is beneficial to those participants who reported benefit and what the role of ICT is in providing specific benefit. Each project built upon the insights from the previous projects. The potential benefit of ICT use in self-monitoring, particularly with mobile devices, has been highlighted by all three projects. Further research on the interaction between health care consumers and ICT, how their needs are represented and the actual role of the ICT is the next step in the journey.